Bound Item Carnival again. 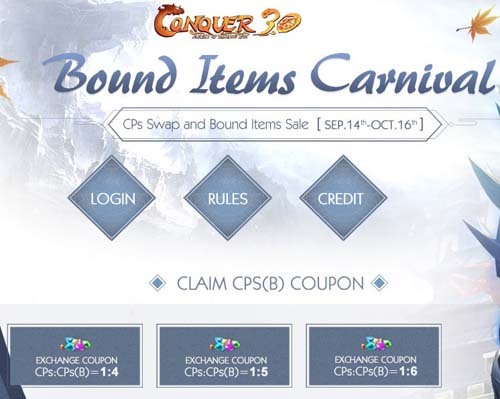 During 9/14-10/31, you can exchange CPs for CPs(B). Both the exchange rate and swappable CPs are greatly increased. You can spend these CPs(B) on bound items. +4/+6 Bound equipment are on sales, too. All are at very competitive prices. You can also spend 27 CPs on Fortune Wheel to lottery for a special item. Don't miss this good chance to win the desired items.